• We are planning Trail Work Details on this coming Saturday & Sunday, April 6 & 7. 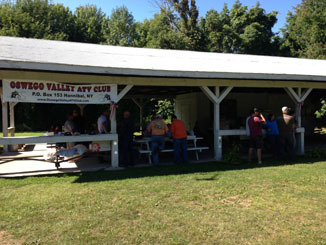 Each morning, meet at 9 am at the Clubhouse, 151 Muck Drive, Hannibal, NY. We will be moving branches and cutting up downed trees, etc; bring ATVs and tools. If you can help one or both days, great. If you can't make it this time, there will be other opportunities. Thanks! • Trails will open on April 15th, weather permitting. • NEXT MEETING: Tuesday May 7th, 7 pm, Hannibal American Legion, 226 Rochester St., Hannibal, NY. Access to the entire Village of Hannibal has been granted on a TRIAL BASIS. 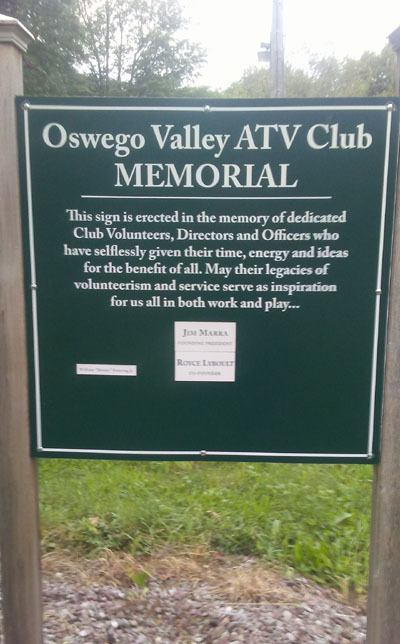 We have access now from the trailhead on Oswego Street down into the village. Let's continue our great relationship with the village by obeying all the rules. Unfortunately, the Landowner of the Tops property, Not Tops, will not give permission to access the store, from the trail behind due to liability concerns. We continue to work on this! • PARKING IN CATO: Although supposedly we are allowed to park in the snowplow semicircle on South St. (Rt. 34), the "No Parking" signs are still there. So that there's no chance of mistakenly being ticketed, we should all now park diagonally south across the road at the foundation of the burned down TC's Place, whose owner has granted permission. • Apply for club membership by filling in and mailing our Registration Form. Memberships, ATV stickers, and a parking pass are immediately available at Hannibal Quick Mart, 971 Cayuga St., Hannibal, NY 13074. They are also available from Mike Blasczienski (315) 806-1933. • We meet the 1st Monday of every month except for July and Sept holidays. Please see newsletter or our Calendar for dates and locations. All meetings start at 7PM. • The portion of our trail through the sold Sawyer property remains closed To ATVs. The property is located between the two mobile home parks just up the road from the garage station on Rathburn Road. • Please Note: Dirt Bikes and Motorcycles are not allowed on our trails. • Royce Lyboult's name (club co-founder) has been added to our Memorial sign in front of the Clubhouse on Muck Drive in Hannibal. See photo.